Dan Whitney has likely befriended more kiters than any other retailer alive if you take into account not only his retail work, but all the folks he’s met at festivals and other events around the country… So anyway, Kitelife has been actively searching for interesting Kite Photography for our pages, and Dan Whitney has kept photographic keepsakes of his customers and friends – and their kites – since he started “Gone With The Wind.” True! Dan, like me, you’re kind of easing into “Middle Age” now… When did you really get started flying kites and how did all that happen? What intrigued you about kite-flying and got you going? Hi Dave. 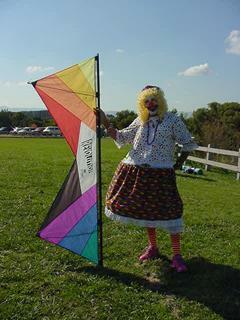 I flew my first kite when I was about 10 years old, that was 52 years ago, OH MY!!! There was a small grocery store just down the street where we lived and they had a barrel filled with kites and the price was right, ten cents a kite. My friends and I would buy a few and head for the local hills. There was a special place where we flew our kites. It was near a large rock that we named, “White Rock”. We never solved the mystery of who painted the rock white. When anyone said, “Meet you at White Rock”, you would grab your kite and head up there. Sorry Mom for the missing sheets. So you flew kites all this time? Kites were part of my growing up years until I turned about 14. Then music became my main interest. One of my friends was a pretty good guitar player and started to teach me how to play. Before we knew it we were playing at our teen dances, Friday night parties, and talent shows. By this time kites were a forgotten toy of the past. When did you start to fly kites again? After raising a family and working at a few different occupations, I finally settled down running my own auto repair business. One day my oil salesman came in and he seemed to be in a rush. He asked if he could just take a quick order and leave, and I asked him why. He said he wanted to go to the park early and fly his kite – I just turned 10 again!!! I asked him what kind of a kite he had and he said a two line stunt kite. I asked a lot of questions and he said it would be easier if he did a short demo out in front of the shop. That’s all it took. I was hooked again! So, like all good kiters, you began to accumulate a bunch of kites, right? What happened to me was that after the demo I saw at the shop, I went down to the park and watched these fliers fly their kites and I was in total amazement. I had to have one. I asked where did they get them and was told any hobby shop, so off I went to a hobby shop and I got my first dual line kite. Of course I got the wrong kite. It had clunky handles and rope for line and I had a heck of a time with it. Finally I connected with a local guy named John who sold kites out of his house and I bought a Top Of The Line Spin Off, a Hawaiian Team Kite, and a Flexifoil. John dropped out of sight after a short time, and then I went looking for other places to buy kites. I came across a small shop in San Jose, CA but all they had were the Top Of The Line kites. 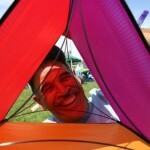 To make this story short, I think in the beginning I had all the colors and kites Top Of The Line made. This is a funny story… Now I’m totally hooked on kites and I wanted more kites and different ones and a kite store finally opened right near where I lived. I was buying all my kites there and one night I went in and I guess it was the owner working that shift. I was prepared to spend about $1,000.00 on kites and I did ask for a discount. He said he didn’t discount and if I wanted one, why not open my own kite business and buy at wholesale. What a great idea! So I left not buying anything, and the next day I applied for all the normal business licenses and permits. My partner at the auto repair shop picked the name, “Gone With the Wind Kites.” I have to say thanks to the kite store owner, but I don’t know where he went. So all of a sudden, you’re involved in business… What did you do then? Did you go out and rent a store front? Did you contact all the kite makers and have them send you samples? How did it all happen? 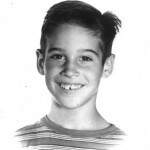 I was still raising my family and the auto shop was my main source of income. At first, Gone With The Wind was a hobby business. It was really a way for me to support my habit at wholesale prices. Well that didn’t work out because when I tried to buy from the different manufacturers, I was turned down because I didn’t have a store. Then one day at the flying field I met Tom Emery who made kites at home and he was more than happy to sell me kites at wholesale. Tom gave me my first break. After selling all of his kites that I could to the local fliers, I still had plenty of inventory left. A friend of mine suggested that I see a friend of his that had a hobby shop and see if I could put kites in there on consignment to sell off my excess inventory. That worked out great, and one day I asked the owner if I could use his store window to take photos and I used those photos for proof of having a kite store. Sort of sneaky, but you do what you got to do. I used the auto shop as the shipping address and then was able to buy at wholesale. The first manufacturer to sell to me was Top Of The Line kites and then Cobra kites. Now that I had references, I went on to add Revolution kites, and from then on I could buy anywhere. I had all the kite magazines at the time and sent off letters to the other manufacturers. Sometimes I would get just the catalog and no price sheet. But in placing a real order by phone, then I got the full price sheets with that first order. There were some companies that only had a single printed sheet of their kites and prices and not a very good description about them. I did try a few of those and was really disappointed. Dogs don’t like to fly I found out. That was the start of the GWTW bargains. And how did you drum up enough clients to sell your wares? Word of mouth? 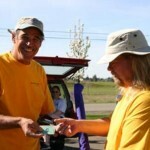 People you met at kiting events? Casual fliers you saw flying in the parks and fields? Was the Internet even in existence then? Did you print a catalog and mail it out? I flew regularly at different parks and I would put up kite displays showing the kites that I carried and I gave lots of lessons. Usually after a lesson, a sale was made. I was so excited to sell to a new flier that in the beginning I would take their photos with the kites they purchased and kept them in a scrapbook. With these new fliers flying on weekends, they would get other people hooked. 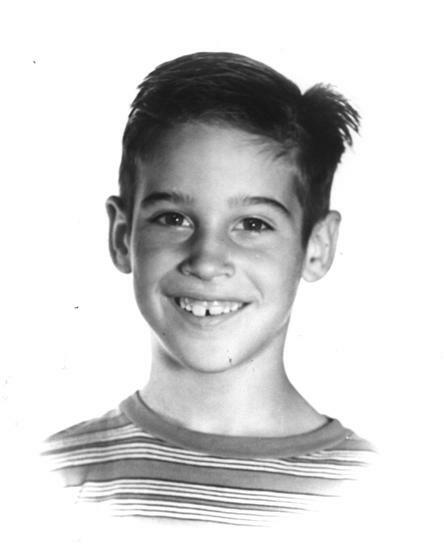 At first all I had were business cards with an email address on them and an answering machine at the house. I kept most of my inventory in the garage, and an extra bedroom served as my first office. I got tired of loading and unloading my inventory from house to car and I finally built a kite cabinet and rack in the back. I had slots for about 30 kites, two drawers for miscellaneous items such as line, straps, winders and kite stakes. I also carried 3 small plastic storage boxes loaded with kite parts and I could do kite repairs on the spot. Pretty much wherever I was, I had kites ready for new owners. So what people actually helped you grow your business? How did that all come about? I’m sure a good part of it was doing whatever “worked,” but did someone step in and help you get organized? At first it was just me. 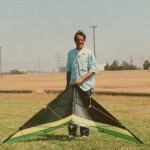 Then one day Brian Todd came in for some kite parts. We talked a little about his flying and what he did for a living, and at the time he was unemployed. He said that he would love to help out and that he was good at doing displays and photographs. So Brian came in often to change kites around and we worked out a barter system for pay. 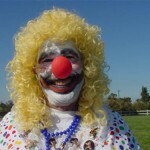 Then another kite flier came in, Bob, and he suggested that I do a web site and get on the internet. This was in 1997. Well more bartering took place. 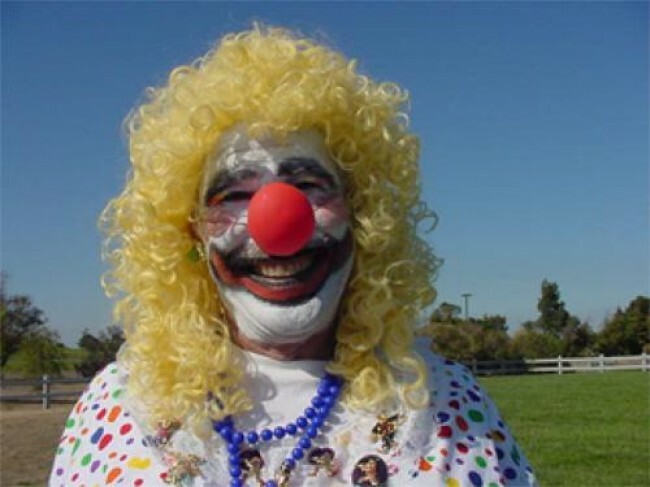 Bob didn’t do the web site – he taught me how to do it. Since this was all so new to me I had a very hard time understanding these new words, ISP, URL, links, server, publish, etc. It drove me to tears, but finally I caught on. 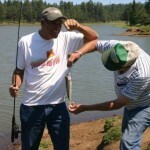 Bob showed me a trick of holding down the mouse and copying photos. Well, that trick got me in big trouble with another kite shop. It’s not nice to copy other people’s photos I learned. Brian was a photographer and I let him pick out my first digital camera, a little Sony. 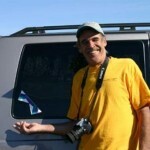 Brian did most of the photos for the first web site and I just watched what he did and how he used Photo Shop. Brian stayed on for quite awhile at the shop and played a major part in all the aspects of running the store. Bob came in every so often afterwards to see how things were going. Both of them played a major part in the success of the GWTW web site and business. After getting used to working with the web site for about two years it was time for a change. One day Rob Vreeland came into the shop. (By the way, Rob just did an article for Kitelife.) In his hand he had a sample homepage very similar to the one now seen on the internet. He suggested that if GWTW was going to grow that it would be a good idea to have online ordering and an updated site. 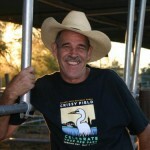 Rob also created the Forum that is still up and running and very popular. Tell us a bit about your clientele… Were they all sport-kite people in the beginning, or were you dealing with the SLK people and the recreational fliers too? Did you also sell repair parts and supplies to home builders? 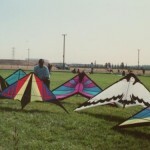 In the beginning most of the kites that I sold were dual line and Revolution kites. I wasn’t what you’d call a SLK kite flier and I didn’t promote them until a little later on. Now I’m talking about the days before I did GWTW full time… When I opened the store my business plan changed. With the internet, the client base grew so fast. GWTW has gone though a few minor name changes, one being GWTW International. My clients came from all over the world. You name the country and most likely GWTW shipped products there. You asked the question earlier about being organized. Well I tried, but with limited space even at the kite shop things got misplaced. I think I had just about every part for every kite that I carried in inventory. Some of those parts are still available at GWTW online. They’re just not listed on the web site. For some reason I just loved having kite parts on hand just as much as having the kites. The only product that was a pain to deal with was kite fabric, and that was later dropped from the inventory. But all the other kite making supplies were kept in inventory. To become an all around kite store, the SLKs were added to the inventory. White Bird Kites was one of my first major suppliers. 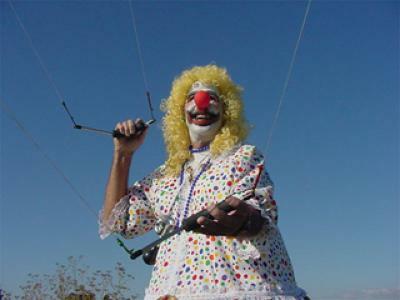 My main core of the business was still dual line kites and with the ad that I ran in the local phone book, those people who found me that way were looking for the SLKs, party kites, and kites that they could make. When I attended my first KTAI trade show, I brought a good selection of SLKs back to the store, and they were good sellers right along with the other products that I offered. By this time, you’re pretty much in the business hard-core! Tell us a bit about what was going on in “the kiting world” at the time… Who was “hot,” and what new and exciting changes were happening? What Kites and what companies hit the scene with a bang? Was there lots of “energy” in the kiting game? This was an exciting time for me. Being full time now, I could keep up with all the changes taking place. Trick kites were becoming more and more popular and I had to have them all. Benson, HQ and Prism were HOT!!! At the field we all were trying to do the latest tricks. 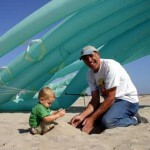 Along with trick kites came the designs by Peter Betancourt of Air Master kites. These were some of the most beautifully appliquéd kites to come on the market. 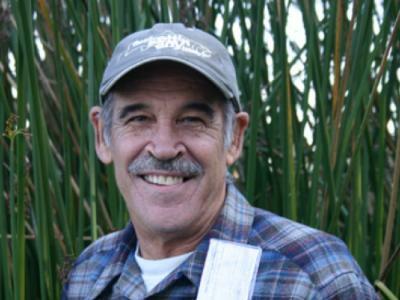 The videos produced by Dodd Gross and Mark Reed changed the way kites were being flown. At the shop I could watch those videos along with the customers that came in. The only tricks that we could do at the time were the axle, back flips, and a few others – nothing like what we saw in those videos. We all wanted to fly like Dodd and Mark. And How, and When, and Why, did you start taking kite and kiting photographs? Your photo work seems to zero in on the people in kiting at least as much as the kites. Was all that just an accident, or did you plan to do it that way? With the first web site, it was so boring with just text and scanned images that the use of photographs, and original ones, were a must. I looked at the other popular online sites to see what format they were using and started there and eventually developed my own style. At first both Brian Todd and I were photographing just the kites, but then we tried to add a more attractive backdrop other than just blue skies. While attending the kite trade shows is where I finally started to take more of the photos. You could call it on the job training by Brian. I think in 1998 is when I got a little more acquainted with photography, which included taking photos at the kite trade show and some of the major kite festivals – with Washington State International Kite Festival being one of my favorites. More people photos started to appear then. Those were taken on purpose. I thought my friends would enjoy seeing their photos on the internet. I just couldn’t write their name under the shot, and that’s when the story lines started. I wanted other fliers to see who was who, and you can only have so much fun taking a photo of a kite, but when taking people photos, there’s never the same photo twice. I have to say the kites that I thought to be of excellent workmanship were Sky Burner kites, HQ, Aries, Benson, Revolution, Flexifoil and Prism. When a pilot asked me which kite did what the best, I would always have a few for them to try. I had my favorite kites from time to time, and most of my kite flying customers would wind up owning one. My first recommendation would usually be the kite that I was always flying. I would like to think that everyone used GWTW as there kiting source. We sure tried hard to make that happen. And somewhere along the way, Dan Whitney also became a “flier’s flier” or “that kite-seller at Gone With The Wind…” How did you begin to get such a reputation? When it comes to someone’s reputation, I built mine on honesty and that the customer is always right – even if they are wrong. Being a flier also made a big difference to my customers. During your hey-day as “Mr. GWTW,” you likely saw the rise and the eventual decline of the big national festivals and competitions. Can you give us some idea of who the “players” were that were involved with the whole national competitive scene? Who started it, who fed it, and then how did it begin its slide into obscurity? 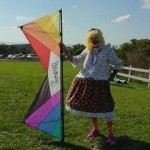 Along with running the kite store, I also competed in Experienced Pairs for a few years. My flying partner was Burnett Lee, and the team name was Gone With The Wind. I have to say we were really new players, and we were able to compete with so many established teams when we started. 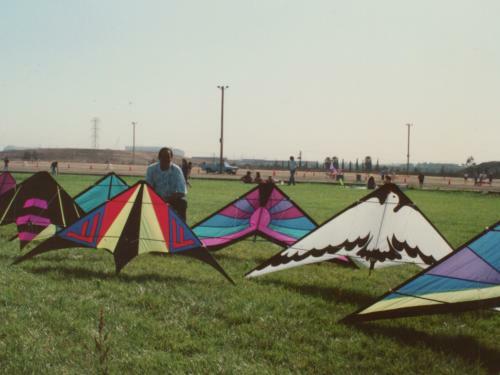 We had the chance to fly at the last Redwood Coast Kite competitions in Eureka, CA, 1992/93, and we just happened to take first place. “Players”, well I have to say John Barresi was one of them. I watched him do an axle in the competitions here. This was the first time I had seen this new trick. It was unbelievable at the time. 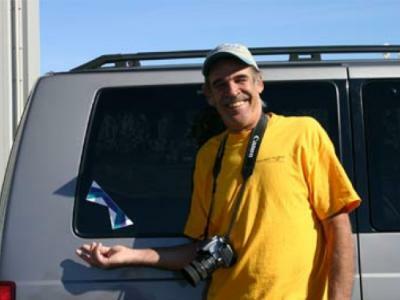 Some of the other players that I remember from my early days of kiting were the Top Of The Line team, Lee Sedgwick, Ron Rich, and our local team, Air Art in California. Other local fliers at that time that did quite well in competitions were Michael Weingand, Miguel Rodriguez, Kobi Eshun, Brian Champie, John and Bruce Morrison, and many more. As to who started the festivals and competitions, one name comes to my mind – Roger Chewing. Looking at videos from the late 1980’s, he would have to be the one. Well for me, I vote for Roger. I would have to say on the “who fed it” part of the question, it was the manufacturers. That was when kiting started to really grow. There were just enough manufacturers to benefit from sponsoring these events, and they did just that. As the number of manufacturers grew, the money pie shrank and the manufacturer’s incentive to keep on sponsoring these events eventually disappeared along with the events. 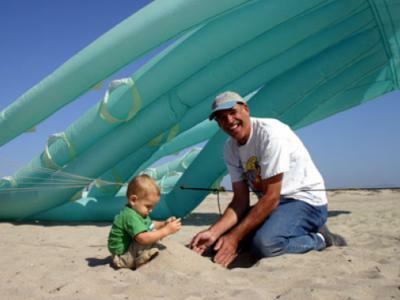 With the demise of our nationally ranked competition circuit, can you elaborate on how the Bay Area Sport Kite League got started? Who had the ideas, who were the people who got BASKL going, and who keeps it alive today? Were you actively involved in all that? This would be a question to ask Darrin Skinner, but here’s what I know. BASKL started in 1995. I wasn’t involved in its beginning, but I’m guessing Darrin and Susan Skinner, Chuck Sigal, and Brian Champie had a lot to do with getting it started. In 1996 or 1997 I did spend a year on the fund raising committee and was quite successful, thanks to all the manufacturers at that time. The current president is now Don King. There are about nine board members that keep the inner workings of BASKL going. New elections just took place last December, so I better not guess at their names here. This is a well run organization. When it comes to the day of the competitions, the competitors take on the duties of field setups, running the event, and judging. There are volunteers that run the sound system and scoring on the day of the events. There’s been a slight decline in BASKL competitors this last season and the current board of directors are trying new ideas to get more people to compete. There is more information on the BASKL web site. Everyone take a peek. Or better yet, come on out and compete! So by this time you had at least fifteen years in the sport, and you saw LOTS of competitions… Who were some of the talented and skilled pilots, the ones who became consistent top-ranked competitors? I could sure make a long list, but I will limit it to pairs teams as that’s what interested me the most during my competition days. 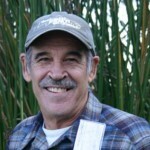 Pairs Teams: Team Dos Avispas with Brian Champie and Miguel Rodriguez, and Team Papalotes with Tom and Barbara Stoner. What do you think made them so good or drove them to the top rankings? By the late 90’s, you apparently made a decision to bring someone else into the business. How did you reach that conclusion? What caused you to want to move on, and how is that working out for you now? I decided to sell GWTW because of domestic reasons. I could no longer give GWTW 100%, so it was time for me to make a change. In building the new web site that you see today, I was lucky enough to have the help of Steve Hall working on the database with me. Steve has the same drive as me, if not more so, and you don’t find too many people with that. Steve had mentioned a few times that someday he would like to have a kite store, and he was a natural choice to continue GWTW. I made a phone call to Steve one night. We discussed a few things and that’s all it took. Then about a month later GWTW was in Chico, CA and I was retired. I love my retirement! More time to fly kites now. 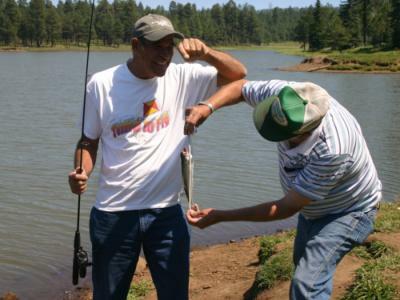 😉 My family, friends, travel, fishing, photography, gardening, sewing, hiking, and biking keep me busy and happy. While you’re no longer active as a retailer, what do you make of the current state of affairs, with kite shops nationwide focusing more and more on toys and playing to the tourist trade? This year at KTAI, many of the shop owners mentioned that they no longer fly regularly. How do you think this affects their ability to sell kites? The success of a business depends on how much you put into it. A kite shop owner that doesn’t fly his kites will not be as successful as one that does. Knowing your products well and being able to talk about them honestly is a key to making sales. Being able to tell how they fly, how they feel, and what their personality is to a potential in-store customer or even an online customer, will result in a sale more often than not. Dan, you’ve had a good long run in the kite business. Along the way you’ve made many friends. Who are the people you treasure now? Which friendships have been especially meaningful? And who do you miss dearly? Dave, I made many new friendships and I treasure all of them. To single out a few of them, one would be my close friend Brian Champie. There’s never a dull moment with Brian and he comes up with some of the oddest places to fly your kites. One of those was flying my Maxi Octopus from the top of the Point Arena Lighthouse. One of the saddest days that I had was on July 4th, 1996 when Tom Turner, a customer and new friend, passed away on the flying field. He was a special person and will always be missed. 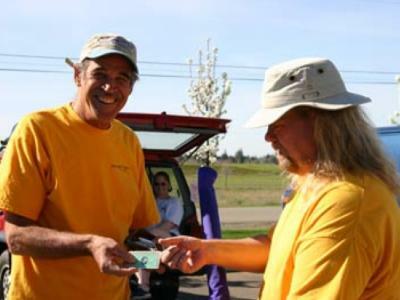 If I had to pick a single special day, it would have to be when Burnett and I flew at the Redwood Coast Kite competitions and took that first place trophy. 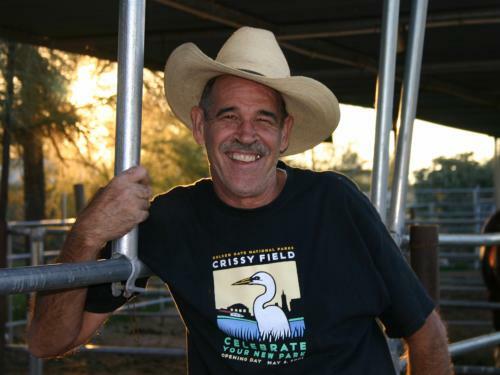 Burnett and I started flying at the local fields and became good friends. We were always messing around flying pairs, but not seriously, and after a while someone talked us into competing. We clicked as a pairs team. We could almost fly a full routine without any verbal commands. Back to that day of the competitions, Burnett and I flew to the song, “Old Time Rock And Roll.” I remember that most of the competitors were flying to classical music or sound tracks and I was thinking to myself how different our music was going to be and how it was going to be received. WOW!!! The spectators came up to us right after our routine and gave us hugs and showed their appreciation for our having put on a good show. Talk about a magical moment, that was it. It was a 7 hour drive back home and we never once stopped talking about our day. What, out of all your long experience in kiting, still “thrills and delights you” or “tickles your fancy,” or “lights your fire” when you think about it? There are a couple that come to mind, one being when Burnett and I did the first tucked/refueled axle in competition, and we were the first ones to do it!! This was at the L.A. 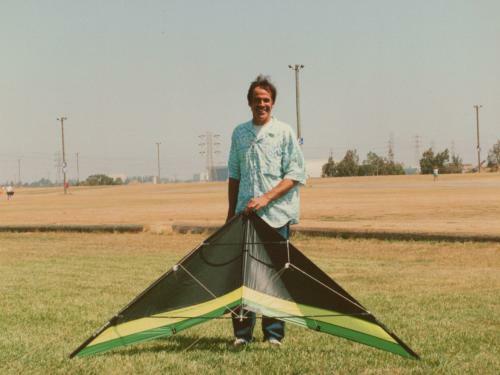 Sport kite Classic, 1998, El Segundo, CA. We practiced that maneuver over and over again and felt very confident in doing it in competition. That tucked axle took place just about two thirds of the way through our routine, a risky place to do it, yep, but on this day our kites lined up perfectly. We had the best of winds, both kites laid out very flat and axled at the same rate of speed, we couldn’t ask for it to be any better. We caused a little excitement that day and it will always be remembered. I think we took second place that day. The other was my first trip to WSIKF. 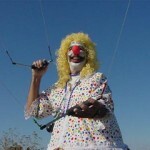 Brian Champie and I went to the south end of the beach one day and pretended that we didn’t know how to fly kites. We would approach different fliers and ask for lessons. We would fake having trouble learning and then say to the unsuspecting people that we think we got the hang of it and proceeded to do all the tricks we knew. What fun!!! We also approached many other fliers of all different skill levels and to each of them we complimented them on their professional level of flying. Did we get the smiles then. Dan, thank you SO much for taking the time to visit with us. Also, we’re especially grateful for your offer to share your wonderful photographs with us. 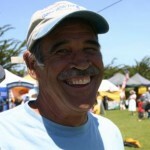 You’ve been a great friend to so many people in kiting that I’m almost tempted to call you “Mr. 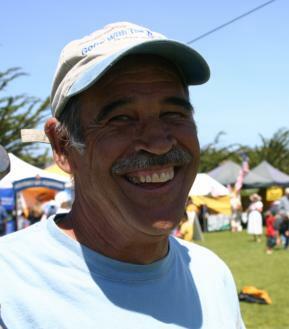 Kiting.” Thank you for all you’ve done for the entire kiting community. Dave, I thank you and John at Kitelife for doing what you do. I had a fun time with this interview and you can call me “DAN.” I prefer that name… See you on the kite field. This entry was posted in 2005, Issue 41 (Mar/Apr), KL Archive and tagged interview, profile, whitney.